Dublin Mid West has a growing population and has expanded enormously over the past two decades, however there hasn’t been any significant improvement or addition with regards to public transport. The Red line Luas which touches the south of the constituency is not useful for the majority of the population, and is already at capacity during peak times. The Kildare train line which crosses the constituency does not currently have enough frequency or capacity for the population and the stations are currently located a significant distance from housing and in the case of Kishogue is not even open. For these reasons, the majority of public transport users in Dublin Mid West rely on the buses. There are some welcome elements of the Bus Connects plan such as the bus lanes, however without a significant increase in investment by the government much of the plan is flawed particularly when it comes to specific communities. The Bus Connects plan provides some much needed improvements in services for the Lucan area, and particularly to service the new estates close to Adamstown. There is a big problem at the moment with buses being too full at peak times and passengers being left behind. The increased frequency on the 25A/B routes is much welcome. However, the loss of a direct bus service from Supervalu/Hillcrest due to the re-routing of the 25A will have a negative impact on residents there, many of whom are elderly. Additionally, there is a need for a bus link between Lucan and Clondalkin. Anyone receiving a social welfare payment have to attend the Intreo office in Clondalkin village. There are significant changes proposed to the network for Clondalkin and unfortunately many of them will have a negative impact on communities. The amalgamation of the 13 and 151 routes means residents in Cherrywood will be left with a longer walk to their nearest bus stop, up to 1km for residents in Cherrywood Park. It also leaves residents in Green Park/Sruleen without a frequent service to the city centre (the 13 is currently servicing the Fonthill Rd). This is the same for residents in the Dutch Village/Woodford area of Clondalkin which would see a big reduction in services due to the 13/151 amalgamation. The new 63 bus will only have a frequency of once an hour and residents would have to walk to the Luas up a very steep hill, or to the Nangor Rd for a more frequent service. This is not possible for residents who are elderly or for people with disabilities or families with small children. The new D3 route will not service James’s hospital which will mean anyone travelling there will have get off close to the N7 and walk to the nearest Luas stop which is 850 meters away. There is no bus service from Bawnogue to Liffey Valley. A large number of residents presented a petition to the NTA in January 2017 demanding a bus service to Liffey Valley, such as the former 210 route. The new plan still has no such service proposed. Services in North Clondalkin are remaining almost the same, however the fact that the new G2 route will terminate at College Green will impact on those who travel across the city for example students in DCU or anyone attending hospital for example the Mater. 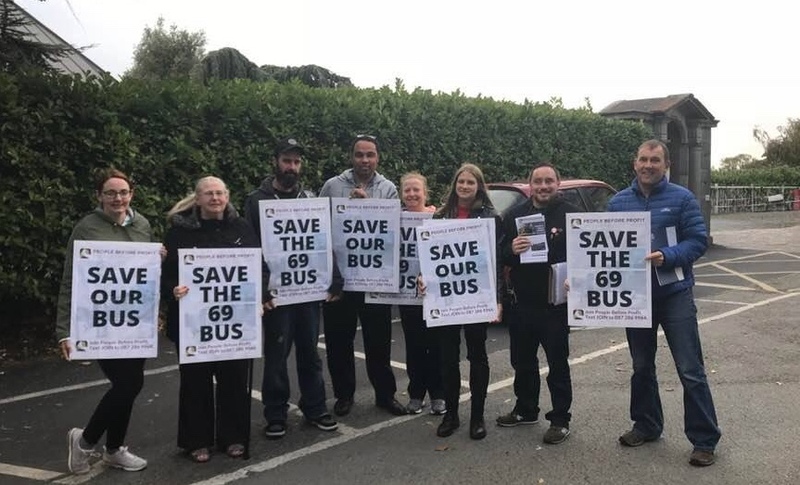 The loss of the 69/69X and 68/68X direct routes to the city centre will have a serious negative impact on residents in Rathcoole and Newcastle. Rathcoole and Newcastle are areas of growth with even more housing expected to be constructed in the next few years. There is a real need for a direct route to the city centre and for the Express routes to continue. More than 2 000 people have signed a petition to keep direct routes from Rathcoole and from Newcastle. There are many links between Clondalkin and Rathcoole, including family connections, children attending school and people accessing services such as social welfare and council services. The W8 is a welcome addition which will provide more options for travel including to Tallaght and to Maynooth. The 18 route bus route is a long established bus route in Palmerstown. At the end 2018 this service will be privatised. The changing of this route will have a major impact on service users of Stewart’s Hospital in Palmerstown village. The 18 bus will be replaced by S4 bus. The hospital have suggested that a solution to this problem that the S4 route travel from Liffey Valley along the N4 to Palmerstown Village/ Kennelsforth Rd to join the Coldcut Road.